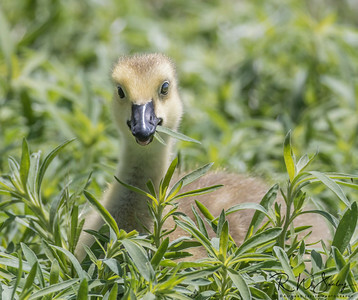 A newborn Canada Goose gosling is eating a blade of grass. 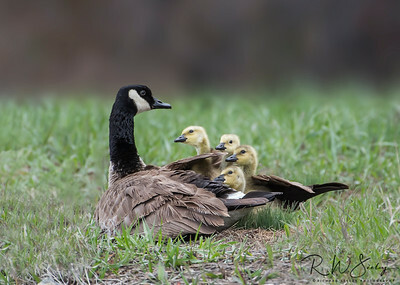 "Gawking Goslings" - Four goslings pop up from mom's feather shelter to see why mom is suddenly on nervous alert. It was a low flying osprey. Thank you Mister Osprey! 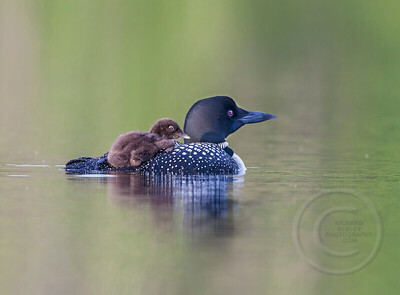 "Backpacker" - Mother loon is a part-time backpacker when a chick climbs on board for warmth and protection. 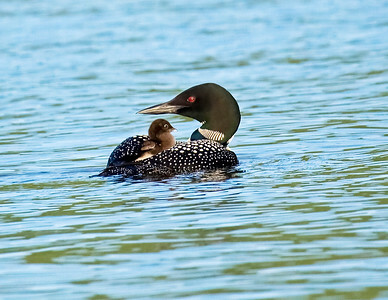 "Backseat Driver" - A baby Loon, safely cradled on Mom's back, appears to be giving directions from the back seat as they navigate the waters of a lake. 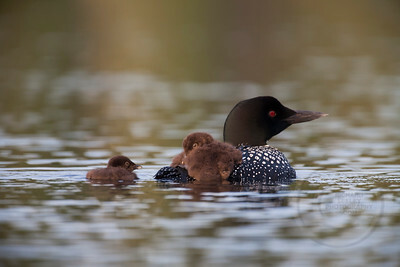 “Leery Loons” – Two baby loon chicks take refuge behind mother loon as they look on with caution to the new world before them. 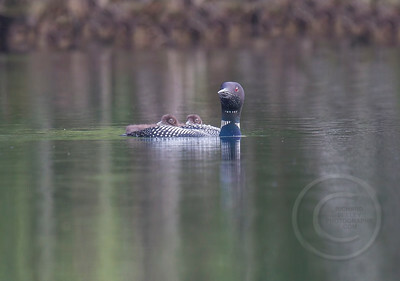 “Room For One More" - Baby loon chicks will crawl up on the back of mother loon for warmth, rest and protection. When still small enough, there is room for one more. 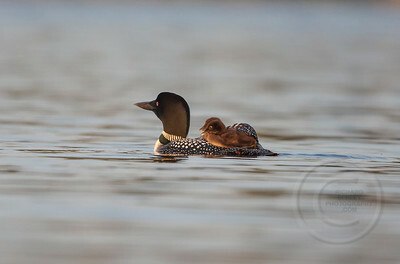 "Two On Board" - Baby loon chicks will crawl up on the back of mother loon for warmth, rest and protection. When still small, there is room for two. 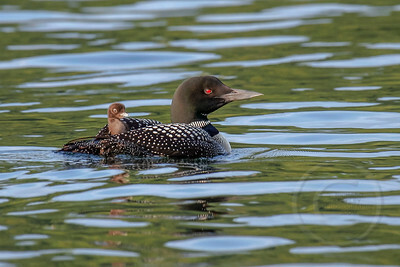 "Easy Rider" - This one month old Loon chick gets an easy and protected ride on the back of its parent. 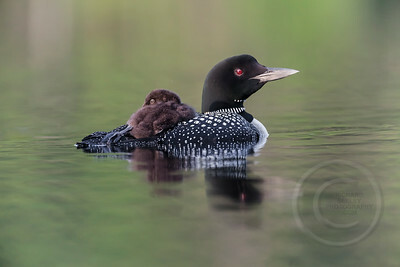 "Lazy Morning" - A baby loon chick takes a lazy morning ride on the back of mother loon. Full House - Four piping plover newborn chicks take shelter under mother plover. 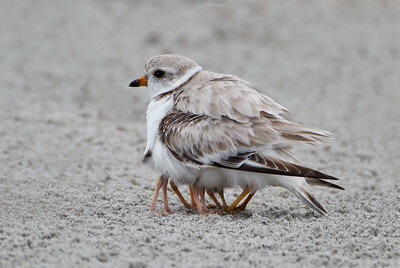 Piping plovers are a threatened species. 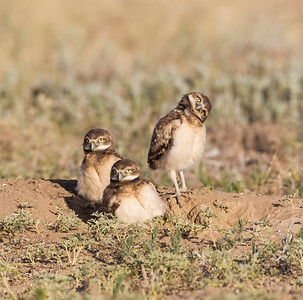 One burrowing owl tilts its head sideways to get a better view of its new world. Commerce City, Colorado. 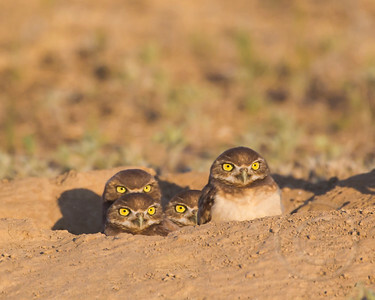 "Barely Burrowed Babies" - Four baby burrowing owlets pop their heads out of a prairie dog hole to see the new world. 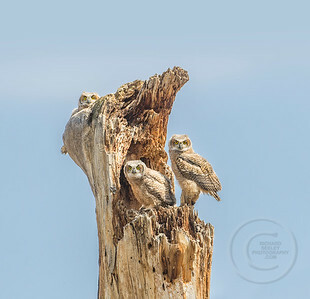 Three To Fledge - Three great horned owlets have been jumping around their nest, exercising their wings and getting ready to take flight in just a few hours. 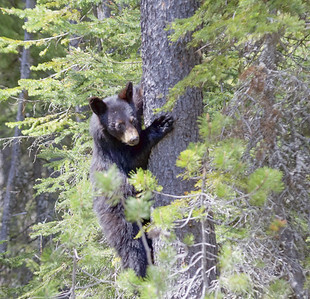 Chatfield State Park, Colorado. 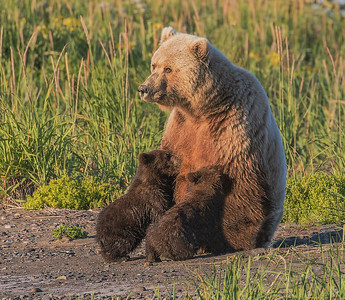 Breakfast Bonanza - Two grizzly bear spring cubs get an early morning breakfast from mother grizzly. 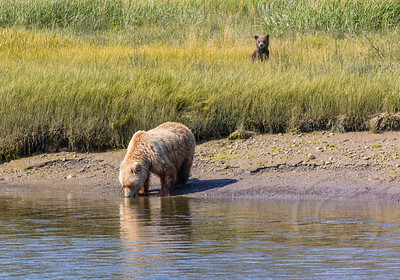 Lake Clark National Park, Alaska. 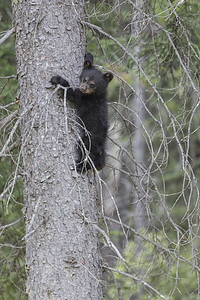 Curious Cub - A grizzly bear yearling cub looks with curiosity at the attention that it is getting. 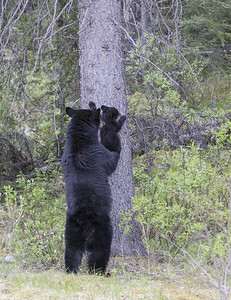 Lake Clark National Park, Alaska. 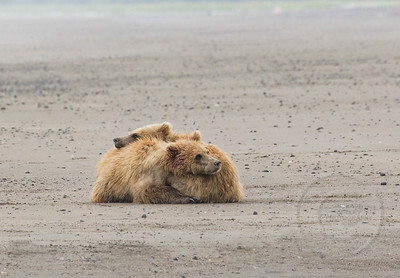 Two yearling grizzly (brown) bear cubs provide warmth and comfort to each othe in the drizzling rain with bear hugs. 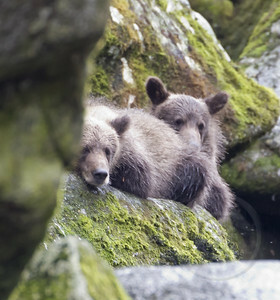 They are napping from their exhaustion after fishing and eating salmon. 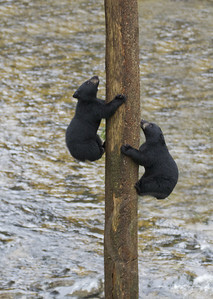 The red stain on the face of one cub is salmon blood. Lake Clark National Park, Alaska. 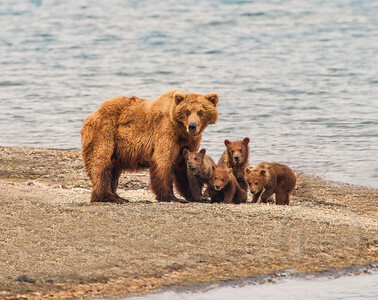 A grizzly bear family of five - a sow and four cubs focus their attention on an incomiing intruder at Katmai National Park, Alaska. Is it a threat? 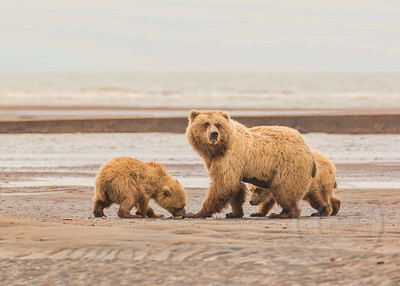 Grizzly Family Claming - A grizzly (brown) bear sow and its two cubs are digging for clams in soft sands of the coast of the Cook Inlet in Lake Clark National Park, Alaska. 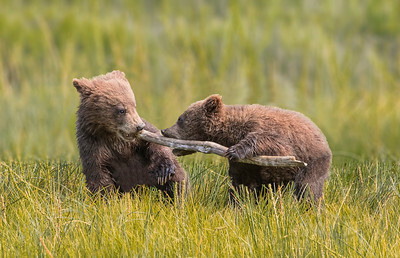 My Stick - Two grizzly bear spring cubs play/fight over a stick in preparation for life in the real world. Lake Clark National Park, Alaska. 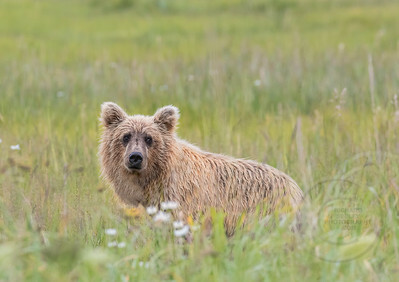 Safe To Drink - A grizzly bear spring cub watches mother grizzly for a sign that it is safe to come and drink the water. Lake Clark National Park, Alaska. 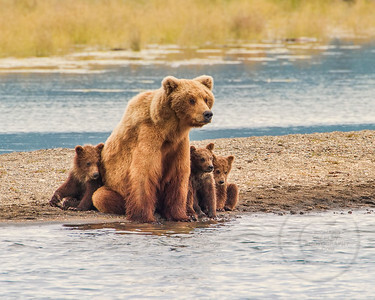 Safe With Mom - Three grizzly bear cubs snuggle up with mom for safety from wild and dangerous world around them. 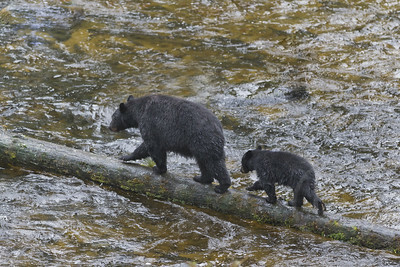 Solace for the Spring Cub - The spring(born in the spring) cub swam out half way across the stream, panicked, then turned around and paddled back to mom where it received solace and comfort at a time of stress. Lake Clark National Park, Alaska. 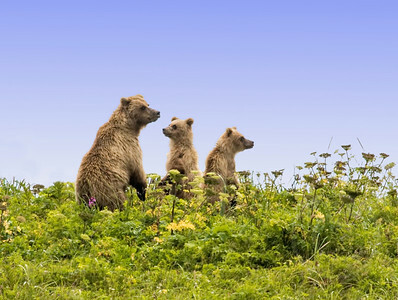 The Bear Skyline - Two grizzly bear cubs and mother grizzly stand up together to make an interesting skyline. Lake Clark National Park, Alaska. 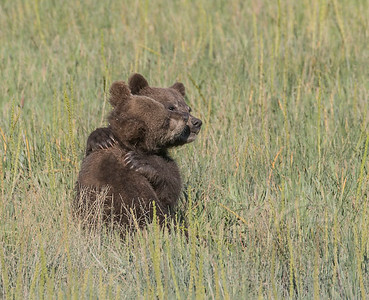 Sibling Bear Hug - Two sibling grizzly bear cubs pause to hug each other while playing. 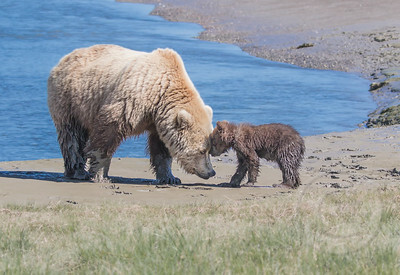 Lake Clark National Park, Alaska.